Peter Sung Ohr, the regional director of the Chicago office of the National Labor Relations Board, ruled Wednesday that Northwestern football players under the College Athletes Players Association have the right to unionize, a decision that eventually could have far-reaching impacts on college sports. The ruling comes less than two week after the university and CAPA submitted their briefs to Ohr for his consideration. Northwestern released a statement on the precedent-setting decision, saying that it is disappointed in the ruling and plans to appeal to the National Labor Relations board in Washington, D.C.
Ohr’s decision reflects Waters’ sentiment, as nearly all of his points back up arguments that CAPA made in the hearing and in its brief. Donald Remy, chief legal officer for the NCAA, released a statement Wednesday that said, “While not a party to the proceeding, the NCAA is disappointed that the NLRB Region 13 determined the Northwestern football team may vote to be considered university employees. We strongly disagree with the notion that student-athletes are employees. “We frequently hear from student-athletes, across all sports, that they participate to enhance their overall college experience and for the love of their sport, not to be paid. — Northwestern tried to prove that the unit represented by CAPA — only scholarship players — was not appropriate, because the team also includes non-scholarship walk-ons. CAPA said it chose that unit because scholarship players are the ones receiving compensation, but it was open to changing its unit if Ohr decided walk-ons should be included. However, Ohr ruled that the scholarship-only unit was acceptable, and he set up guidelines about which players would be included in the union. The group of players eligible to vote will only include scholarship players who are eligible — this excludes seniors who have exhausted their eligibility and recruits who have yet to participate in team activities. Because Ohr believes that scholarship and walk-ons are different, there was no “fracturing” of the unit, which would have derailed the unionization effort. — Ohr ruled that scholarships are, in fact, compensation: “The fact that the Employer does not treat these scholarships or stipends as taxable income is not dispositive of whether it is compensation,” he wrote. That’s a really important note to consider for the future. Do the scholarships have to be taxed if they’re considered compensation? It’s not as cut-and-dry as some people have suggested. Ohr also pointed to the importance of the “tender” that athletes must sign when they accept their scholarship, which he equated to an employment contract. 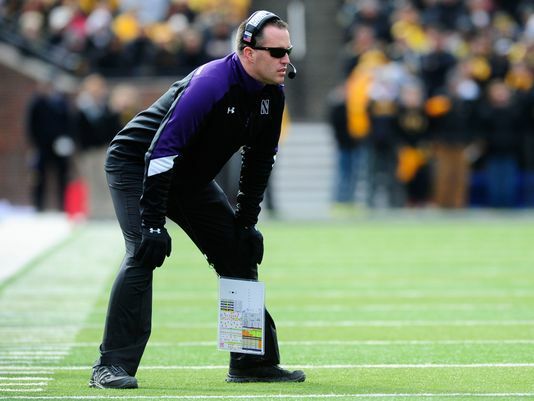 — In his decision, Ohr noted that Northwestern’s move to four-year scholarships is not important, because the head coach — Pat Fitzgerald — is still able to decide whether to pull a player’s scholarship based on how that player adheres to team rules. “Although only two players have had the misfortune of losing their scholarships during the past five years, the threat nevertheless hangs over the entire team and provides a powerful incentive for them to attend practices and games, as well as abide by all the rules they are subject to,” Ohr wrote. That backs up CAPA’s claim that even though Fitzgerald has been a good boss, he is still a boss. — Throughout the decision, Ohr made a number of references to the fact that players are offered scholarships because of their prowess on the football field, and that the responsibilities tied to those scholarships are more athletically-based than educationally-based. He noted that the team handbook says players are “traveling for one reason: to WIN a football game.” He also took into account time players spend on football that is not included in the NCAA’s countable hours. — Northwestern tried to deflect much blame to the NCAA throughout the hearing and its brief, citing NCAA rules that force them to monitor players. Ohr wrote that the NCAA’s regulations over the university are irrelevant. “The fact that some of these rules are put in place to protect the players and the Employer from running afoul of NCAA rules does not detract from the amount of control the coaches exert over the players’ daily lives,” he wrote. — Northwestern cited a Brown University case, in which graduate teaching assistants were not allowed to unionize, as precedent. However, Ohr ruled that the case is not applicable. Teaching assistants, he argued, are primarily students because they receive academic credit for their work. Scholarship football players are much farther outside the educational enterprise. Essentially, teaching assistants have an educational relationship with the university, while football players have an economic relationship with the university. While this was a significant decision, there is still a lengthy appeals process to come, and the case could end up in the Supreme Court. The first step will be for the university to appeal to the national board in Washington, D.C. If CAPA wins there, then Northwestern can decline to bargain with the players and sue in court. Only athletes from private schools will be able to join CAPA. Athletes at public schools will have to petition for unionization with their state boards. Given that a union and its accompanying protections and benefits could be a recruiting advantage for Northwestern and other private schools, the NCAA could face a challenge in maintaining the competitive balance it covets. Northwestern University is disappointed by today’s ruling by the regional director of the National Labor Relations Board finding that Northwestern University’s football players who receive grant-in-aid scholarships are employees and directing that a secret ballot election be held to determine whether the football players should be represented by the College Athletes Players Association for purposes of collective bargaining with Northwestern University. Northwestern plans to appeal today’s decision to the full National Labor Relations Board in Washington, D.C. The University will continue to explore all of its legal options in regard to this issue. Northwestern considers its students who participate in NCAA Division I sports, including those who receive athletic scholarships, to be students, first and foremost. We believe that participation in athletic events is part of the overall educational experience for those students, not a separate activity. The issues regarding the long-term health impacts of playing intercollegiate sports, providing additional grant-in-aid support and providing academic support and opportunities for student-athletes are being discussed currently at the national level, and we agree that students should have a voice in those discussions. However, we believe that a collective bargaining process at Northwestern would not advance the discussion of these topics, in large part because most of the issues being raised by the union are outside the purview of Northwestern. In addition, Northwestern is committed to ensuring the health, safety and well-being of all of its students, including its student-athletes. The University provides primary or secondary medical coverage for all of its student-athletes for at least a year after they no longer are eligible to participate in intercollegiate sports — and beyond if applicable. In addition, Athletic Department staff members offer extensive support and personalized attention for all student-athletes in nutrition, health and exercise training. Northwestern is proud of our students for raising these issues. Northwestern teaches its students to be leaders and independent thinkers who will make a positive impact on their communities, the nation and the world. We look forward to working with our students through other appropriate mechanisms to continue to address these issues.